Here are a few photos from my daughter's 4th birthday party. 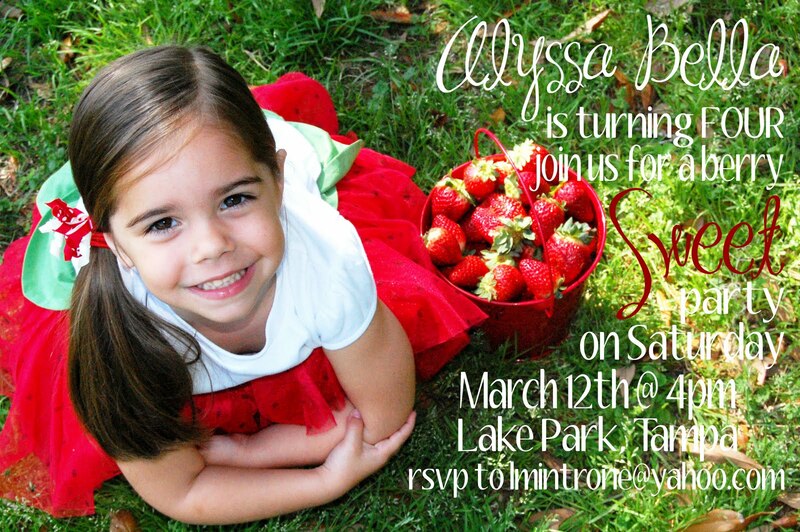 her Strawberry Shortcake Party since her "Pink Party" last year! Always a hugh hit with the kiddos! All paper party supplies ordered from Birthday in a Box. I was very dissappointed but it was too last minute to do anything about it. I just had to laugh about it! Her perfect little outfit is from the "Burst of Spring" line from Gymboree. OMGosh sooo adorable! Thank you for sharing! This is so sweet, I am right with you on the character theme parties but you pulled it together perfectly! So fun to see that you got your sweet skewers from Sweets Indeed. They are cute and delish! So glad to see Strawberry Shortcake is alive & well. You pulled off such a cute party for your adorable little one! Very sweet party! Glad to see you are posting again, we miss you! very nice. You have shared a great ideas to plan the strawberry shortcake party.. Hi...Your post really got me thinking man..... an intelligent piece,I must say. Here I found great idias for Kids parties. The theme of the party is very inspiring and creative. I liked it very much. Awesome pictures you have shared. Thanks for sharing. FOR BEST COLLECTION OF VALENTINE DAY PARTY IDEAS FOR KIDS. You have a very colorful theme for strawberry shortcake. I know my daughter will really like this idea if I am gonna show this theme party to her. She loves pinks and this is what she wants on her 7th b-day party. Hope everything goes fine on that occasion. you are really great blog post thanks for sharing keep it up..!! I am very glad to see such fantastic ideas of birthday parties here and the style of Kids Birthday Party in Miami is also growing according to the desires of people. What a great themed party, and brilliant photography! Are you planning a kids' Halloween party this year? If you are looking for find birthday or other party supplies store, Contact to Thepartystuff.com.sg. This is best place for find party products, here you can many more products, birthday flower bouquets, party bags and others for your birthday party. This is really so cute dear.. :) I too have two cute grand daughters for whom we are planning to have princess party characters los angeles you post helps me to plan ahead..
Hey nice post i am fully inspired here keep continue sharing. I am very glad that I find your regular post here. Which seems to be very important and it made good time pass for me. I will always give a nice thrust look in to you from my bookmark feed, 1Z0-580, 1Z0-117, HP2-N44, After Years of experience we develop easy to learn questions & answers, Audio and Video case study Material guides. I ♥ kids birthday parties nyc! Buy - Play - Break - Become Intelligent. At martmind.com, Buy all the Toys for kids which are required to become intelligent. Wonderful birthday party I've ever seen! Really nice..
this is to nice kids party celebrating or it should be very interesting,. to visit same types of place in toowoomba Kids Parties Toowoomba. Very cool and creative party designs. Amazing ideas, the parties are going more and more themed now days and they look good as well. OOOOO she looks so adorable in her dress. Themed spa parties for girls is now a trend, but thankfully I had a friend who referred to me something special. As you know finding a good kids party places in Staten Island is hell of a job, I was lucky that they took care of all the arrangements at a reasonable price. For the next children birthday party I will highly recommend this place for you. Thanks for sharing these cool and creative party management ideas. When it comes to kids, the event demands special attention. So bright and cheerful! I still remember my 5th birthday party- Strawberry Shortcake themed. But it didn't look like this- this is gorgeous!! My daughter adores this cartoon too. And your ideas about celebrating a birthday are an amazing. Thanks for taking the time out and sharing with us this great post. You are a very good mom. And I wish you good luck. Please keep it good posting. If you need any paper advice or help - just contact with professionals at http://custom-paper-writing.org and feel no responsibilities. The most authentic post ever i read about the Kids apparels so far i must say you have cleared all the required info thank for sharing, keep up the good work and win new rewards at Your Survey Guide. Amazing insight you have on this and I hope you will be adding more in the future. Thanks for an interesting post and I am impressed by the details that you have on this site. Can u suggest me a strawberry cake for my child its her first birthday and i wanna make it special. Do you wanna make your this month special too then take your Kroger receipt with you visit krogerfeedback survey site and win free $5000 gift card by Kroger.